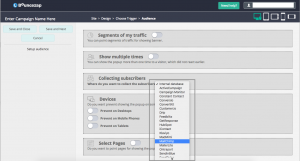 Bouncezap offers seamless integration with MailChimp email marketing service. 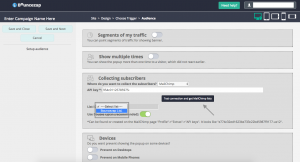 Connecting Bouncezap to your MailChimp email list is easy. 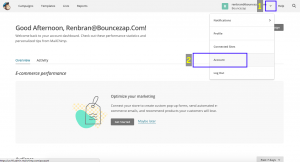 Follow these few and easy steps to connect Bouncezap with your MailChimp account and you can have Exit Intent popups and email capture forms in no time at all. After you’re done building and designing your campaign, you can further configure your campaign by integrating it to different e-mail providers like “MailChimp”. 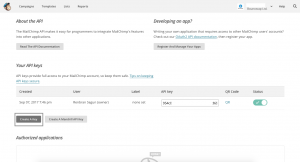 Next, select Mailchimp from Email Provider dropdown. 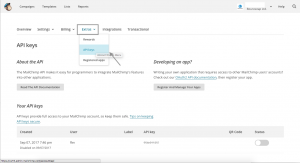 To obtain your MailChimp API credentials, log into your MailChimp dashboard and navigate to your Account page from the dropdown menu next to your avatar and name. On the Account page, you will need to select the API Keys link under the Extras dropdown menu. Scroll down the page, and copy the specific API Key you wish to use. You may also “Create A Key “ if none are listed or you wish to use a new one. 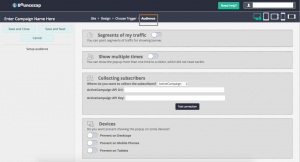 In the Campaign Builder, paste your API Key into the corresponding field. 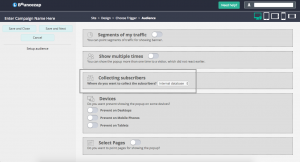 Then, click “Test Connection and Get Mailchimp List”. After getting the Mailchimp list, on the dropdown choose list ID that matches the list name you wish to populate in mailchimp as shown below. Finally you have successfully integrated Mailchimp with your Bouncezap account. NOTE: Don’t forget to click “Save and Next”.